Prior to starting a family, I had a successful career in the beauty industry, but knew this was not a viable option once I became a mother to my 3 gorgeous children. After 9 years, my husband and I started a Salesforce consultancy, where the passion really began! Initially doing behind the scenes admin work or managing the financials but then evolving more into Salesforce and that’s when the passion began! 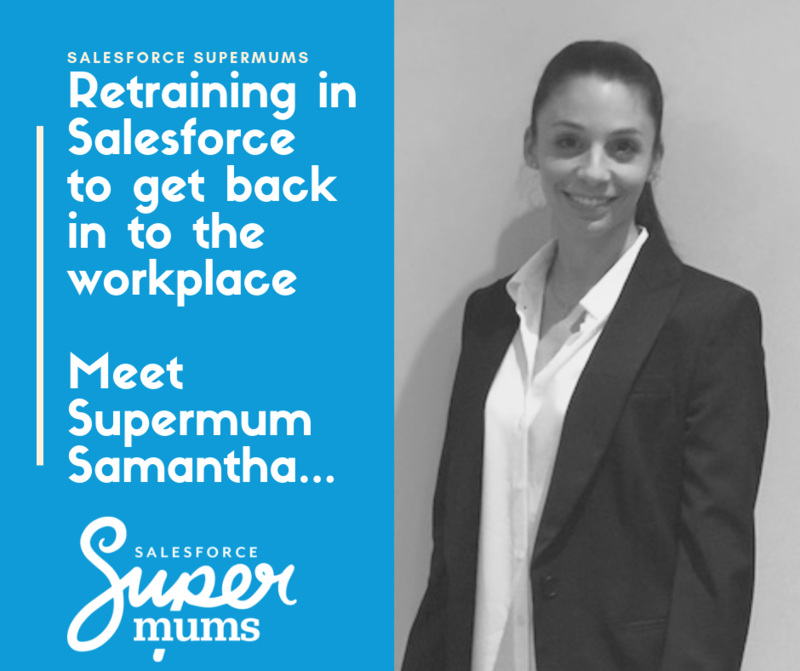 Having used Salesforce for 4 years and my knowledge growing rapidly, I realised this was a perfect step to get me back out into the work place, whilst allowing me to still maintain the flexibility I wanted as a mum. Both the project work and support on offer were a very big attraction for me, having not really been out in ‘the work place’ for 13 years and not had job interview in 16, my confidence needed a boost! I liked the flexibility the course had to offer. And the friendships formed with the rest of my cohort was just a bonus (and huge support). The work experience was a real turning point for me. It was tough, but getting the opportunity to apply all the knowledge you learn at the start of the course into a working org, really is the best way to learn. I would have a weekly meeting with my mentor, during the hour we wouldn’t just go through everything that needed to be done in the week ahead but also look back at any difficulties I had had the previous week. If I was struggling midweek with a task, I always got the necessary support. At the end of the work experience I got the opportunity to train some of the users with the new features I had worked on, which is when I realised how much I had learned and how far I had come! What are you doing now? What does a typical week of work look like? Since March I have been based at one of Economic Change’s clients, Power to Change as their Salesforce Consultant. I work 2-3 days a week some of which can be from home. I have the flexibility that still allows me to be the parent I always wanted to be whilst enjoying the balance of working life. Don’t think you “can’t do it” – I am living proof that you can do anything you put your mind to! Yes, it’s hard work, and challenging at times, but definitely worth the effort! 100% yes! The programme is great, and the ongoing support you receive once the course has ended is equally as good (and very rare). Everyone from Heather, Debra and the trainers genuinely want you to succeed in your new career and go above and beyond to support and advise you in the best way they can. Want to hear more about Samantha’s story, and find out whether Salesforce could be the career for you? This entry was posted in Case Study, Salesforce. Bookmark the permalink.